Latin for the New Millennium Companion Website this website has additional information about Latin for the New Millennium including a "Teachers' Lounge." The Teachers' Lounge is a forum for teachers using and interested in using Latin for the New Millennium series textbooks, workbooks, and enrichment texts. LNM 3 materials on the Teachers’ Lounge include: test bank (Quia and word doc versions), maps, map activities, English derivative lists for students, derivatives quiz bank (Quia and word doc versions), and items for in-class projection. This volume of Latin readings for intermediate level classrooms offers a selection of original texts from the classical period of Latin literature with commentaries and other helpful material based on the contributors’ teaching experience. One aim of this textbook is to enable students to read and analyse their first unadapted Latin texts from prose and poetry and to prepare them for the demands of the AP Latin curriculum; the other important aim is to motivate students to read and to enjoy classical Latin literature The book is divided into three main parts: Part 1 contains authors of the late republic (Caesar, Catullus, Cicero), part 2 authors of the Augustan age (Vergil, Horace, Ovid), part 3 authors from the post-antique era (mainly Erasmus, two pieces of Petrarch and John Park). Each author is represented by selected well-known text passages, e.g. the beginning of Caesar’s De bello Gallico (1.1-7), parts of Cicero’s speeches Pro Archia poeta and In Catilinam, passages from Vergil’s Aeneid (books 1 and 4) and from Ovid’s Metamorphoses. After these three main chapters follow five appendices with information about Roman history (in tabular form), Latin meter, figures of speech and extensive material on grammatical forms, paradigms and syntax – nearly a complete Latin grammar. At the end of the volume, a glossary contains a complete vocabulary for the texts. Since most students beginning to read original Latin texts are ignorant about the historical context and the audience of these texts, each chapter gives fundamental information about the political and social structure of the Roman Empire, supported by many illustrative pictures and maps, and about the authors’ biographies and works. The Latin texts are presented in short passages – sometimes only single sentences – with macrons above the long vowels which help students (and teachers) to pronounce the texts correctly. In the Latin texts the ellipses are completed so that students can easier translate the passage and become aware which elements can be omitted in Latin speech, e.g. the beginning of Caesar’s De bello Gallico (p. 18): "Gallia est omnis divisa in partes tres, quarum unam (partem) incolunt Belgae, aliam (partem incolunt) Aquitani...". This is a very useful device, because such ellipses constitute one of the most frequent difficulties for students of Latin when translating unadapted texts. Furthermore the texts are provided with lexical and grammatical commentaries and "study tips" that help to understand special grammatical features of the passages and to facilitate the translation into English. One example is a study tip (p. 19) for the genitive plural quarum of the relative pronoun qui, quae, quod, which is commonly translated "whose", but sometimes (as in Caes. B.G. 1,1) the appropriate translation must be "of which". It is just such a detail which can be a great difficulty in the classroom and lead to mistakes in tests of Latin, because many students have no problems in analysing case, gender and number of the grammatical forms, but they fail in the appropriate translation. For each passage the textbook also contains exercises on the grammatical features of the text, useful tips for learning new words and phraseology ("vocabulary builder") and more systematic information on special questions of Latin grammar ("language facts") such as the use of pronouns, comparative and superlative, adverbs, and gerunds. All these advantages, however, might be a disadvantage, too, for the content of the texts could get lost under the effect of the sheer quantity of aids and additional material for each sentence. At the end of each chapter the students find another version of each passage, but now without commentary, so they can test if they are able to understand the whole text without help. Under the category "essay" the book makes some suggestions for interpreting the texts. To sum up, this comprehensive volume is undoubtedly an excellent textbook that will motivate students of Latin literature who want to learn to read and translate their first unadapted texts. It offers much material to contextualize Roman literature and the most important authors and genres, which can be a good incentive for students to enjoy classical Latin texts. In addition, the volume seems to be very suitable for developing students’ skills and competency in analysing and interpreting classical literature in its historical and cultural context. So, either the whole volume, or at least parts of it, can be warmly recommended to everyone who teaches Latin literature in English-speaking classrooms. 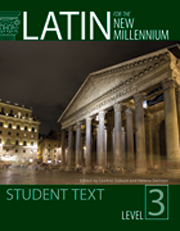 Latin for the New Millennium Student Text Level 3 is a college-level textbook for advanced students of the Latin language. Chapters deliberately offer Latin writings by a wide variety of ancient and renowned authors: Caesar, Cicero, Vergil, Horace, Ovid, and letters of Erasmus. Exercises, short answer questions, essay questions, vocabulary-building lists, study tips, advanced grammatical instructions and more enrich this solid reference and resource, further enhanced by a Latin-to-English glossary and an index. Color illustrations of classical artworks every few pages add an appealing visual touch to this sound-minded text that lends itself well to coursework or self-study. Highly recommended. Latin for the New Millennium Level 3 video overview of the content in this Level 3 Latin textbook from the Latin for the New Millennium series.